Paris, France, 2018-May-04 — /Travel PR News/ — Marriott International has announced a new addition to its Courtyard by Marriott brand with the opening of a property at Paris Roissy CDG airport. 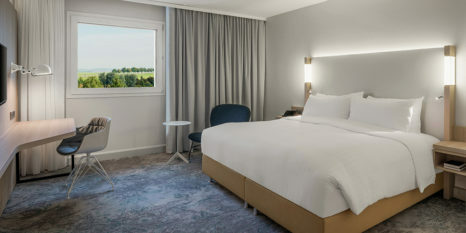 Formerly the Radisson Blu CDG hotel, the property has undergone an extensive 15-month, multi-million pound refurbishment to relaunch as the Courtyard by Marriott Paris Roissy CDG Airport Hotel, making it the brand’s seventh hotel in France. Ideally located between the airport and the city centre, the 240-bedroom hotel boasts the latest Courtyard by Marriott design. This is brought to life through refreshed interiors featuring contemporary and efficient design that mixes a natural colour palette with yellow and blue accents to create a casual yet vibrant atmosphere. The lobby has been redesigned into a flexible space to foster social connections with guests, complete with GoBoard, a unique Courtyard by Marriott concept offering touchscreen technology that allows users to view the latest airport information and research popular tourist attractions. Guests can also enjoy the use of complimentary Wi-Fi. The hotel’s food and beverage offering, Kitchen & Bar, is the first of its kind in a Courtyard by Marriott hotel in Europe, and offers a relaxed, bistro environment with French-inspired menu items. Additional hotel features include 1000m² of event space with 12 flexible meeting rooms, a 70m² fitness centre with state-of-the-art equipment, and a complimentary airport shuttle service. Courtyard by Marriott Paris Roissy CDG Airport Hotel is the first of two additions for the brand in Paris this year, with Courtyard by Marriott Paris Gare de Lyon expected to open in late 2018, taking the brand’s room count in the city to more than 1000. Two further properties are anticipated for 2019, at Porte de Versailles and Creteil, which would increase the brand’s portfolio in France to ten hotels. Marriott International, Inc. (NASDAQ: MAR) is based in Bethesda, Maryland, USA, and encompasses a portfolio of more than 6,500 properties in 30 leading hotel brands spanning 127 countries and territories. Marriott operates and franchises hotels and licenses vacation ownership resorts all around the world. The company also operates award-winning loyalty programs: Marriott Rewards®, which includes The Ritz-Carlton Rewards®, and Starwood Preferred Guest®. For more information, please visit our website at www.marriott.com, and for the latest company news, visit www.marriottnewscenter.com. In addition, connect with us on Facebook and @MarriottIntl on Twitter and Instagram. Courtyard by Marriott offers a refreshing environment that helps guests stay connected, productive and balanced. Intuitive services and design accommodate guests’ needs for choice and control. With more than 1,100 locations in over 50 countries and territories, Courtyard is proud to participate in the industry’s award-winning loyalty program, Marriott Rewards® which includes The Ritz-Carlton Rewards®. Members can now link accounts with Starwood Preferred Guest® at members.marriott.com for instant elite status matching and unlimited points transfer. For more information or reservations, visit courtyard.marriott.com, become a fan on Facebook or follow @CourtyardHotels on Twitter and Instagram. This news release contains “forward-looking statements” within the meaning of federal securities laws, including the number of lodging properties the company may add in future years and similar statements concerning possible future events or expectations that are not historical facts. We caution you that these statements are not guarantees of future performance and are subject to a number of risks and uncertainties, including changes in market conditions; changes in global and regional economies; supply and demand changes for hotel rooms; competitive conditions in the lodging industry; relationships with clients and property owners; the availability of capital to finance hotel growth and refurbishment; and other risk factors that the company identifies in its most recent quarterly report on Form 10-Q or annual report on Form 10-K; any of which could cause actual results to differ materially from the expectations we express or imply here. We make these statements as of the date of this press release, and we assume no obligation to publicly update or revise any forward-looking statement, whether as a result of new information, future events or otherwise. This entry was posted in Hospitality, Hotels, Travel, Travel Management, Travel Services, Travelers and tagged Courtyard by Marriott Paris Roissy CDG Airport Hotel, John Licence, Radisson Blu CDG hotel. Bookmark the permalink.